The building now housing Midlothian Apothecary was originally constructed in the 1920s as a car dealership. It later became a grocery store, and then both a grocery store and a U.S. post office. The pharmacy was started in the 1950s and shared space with the post office. 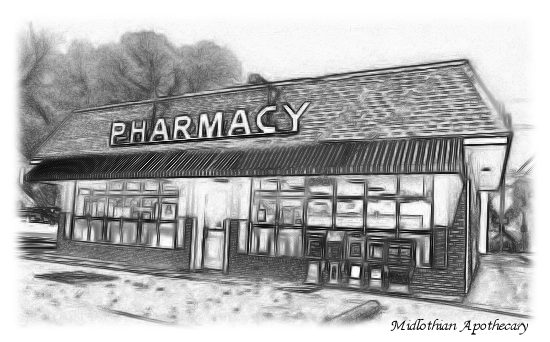 The Darbys purchased the pharmacy in 1990, changing the name from Midlothian Pharmacy to Midlothian Apothecary to reflect their interest in the art of pharmacy practice. October is Midlothian Apothecary’s 28th Anniversary! Midlothian Apothecary offers great customer service, very competitive pricing, and quick efficient customer care. We specialize in compounding to help with all dosing problems, hard-to-get remedies, and our veterinary patients. We also deliver each afternoon to our nursing home patients, to our local area businesses, and to our neighborhood patients. We accept most third party insurance plans, including AARP, Aetna, Anthem, Cigna, CVS-Caremark, Express Scripts, Humana, Medco, and Tricare. We are truly “Your Neighborhood Pharmacy”. And don’t forget, Midlothian Apothecary has a fountain that serves breakfast, lunch, milkshakes, limeades, ice cream and an array of homemade salads. Come by and meet your neighbors or just have a good old time with some delicious food! During each week in October enter to win a local area restaurant gift card (Palermo, Outback, Hard Shell, Ruth’s Chris). One entry will be given with each prescription filled. One winner will be drawn at each store, each week.